Similarity to the "Sefer Yeẓirah." An Outline of the Zohar. Pseudonymous work attributed to the tanna Neḥunya ben ha-Ḳanah, a contemporary of Johanan ben Zaḳḳai (first century) because it begins with the words, "R. Neḥunya ben ha-Ḳanah said" ( ). No reference, however, to the work is to be found in Jewish literature before the thirteenth century, which fact is sufficient to dispose of the idea that the authorship can be ascribed to Neḥunya. Naḥmanides, in his commentary on the Pentateuch (Gen. i. ), or, according to Steinschneider, Ephraim ben Samson (compare "Hebr. Bibl." 1872, xii. 116; 1874, xiv. 132) was the first to quote the work under the title "Midrash R. Neḥunya ben ha-Ḳanah." The "Bahir" contains cabalistic explanations on the vowels and accents, which were introduced into Hebrew about the seventh century. 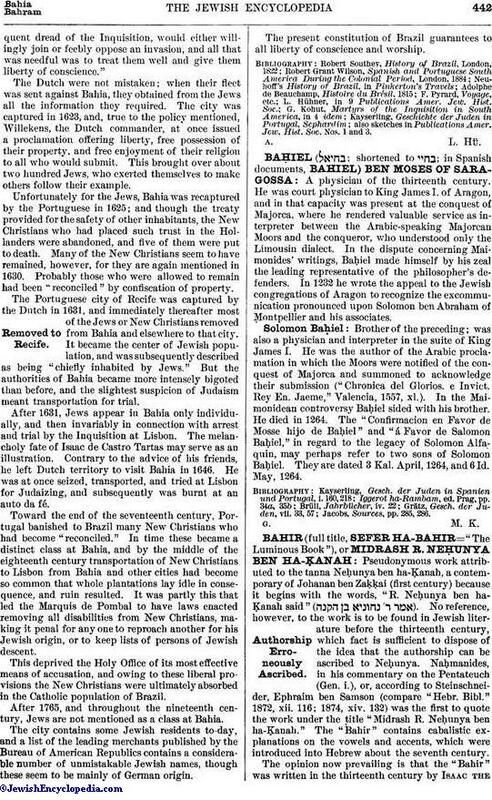 The opinion now prevailing is that the "Bahir" was written in the thirteenth century by Isaac theBlind, or in his school (compare Baḥya ben Asher's commentary on the Pentateuch, Ex. xxiv.). The first sentence, , "And now men see not the light which is bright in the skies" (Job xxxvii. 21), being isolated, and having no connection with what follows, is taken to be an esoteric allusion to the blindness of its author (compare Landauer, in "Literaturblatt des Orients," vi. 215; Jellinek, "Auswahl," p. 14). The "Bahir" assumes the form and style of an exegetic Midrash on the first chapters of Genesis. It is divided into sixty short paragraphs, and is in the form of a dialogue between master and disciples. The names which occur most frequently are those of Reḥuma, R. Amorai, and R. Berekiah, who are otherwise unknown. Except in the first sentence the name of Neḥunya ben ha-Ḳanah is never mentioned. The world, according to the "Bahir," is not the product of an act of creation. Like God, it existed from all eternity, not only in potentiality, but in actuality; and the Creation consisted merely in the appearance of that which was latent in the first "Sefirah," "Or ha-Ganuz," or, as it is called, "Keter 'Elyon," which emanated from God. This Sefirah gave birth to "Ḥokmah" (Wisdom), from which emanated "Binah" (Intelligence). From these three, which are the superior "Sefirot" or "Ma'amarot," and form the primary principles of the universe, emanated, one after another, the seven inferior Sefirot from which all material beings are formed (compare Pirḳe R. El. iii., , "Through ten ma'amarot the world was created, which are reduced to three," etc.). All the ten Sefirot are linked one to the other, and every one of them has an active and a passive quality—emanating and receiving. The efflux of one Sefirah from another is symbolized in the form of the letters of the Hebrew alphabet. Thus the gimel (ג), shaped like a tube open at each end, represents a Sefirah, which receives strength at one end and discharges it at the other. The ten Sefirot are the energy of God, the forms in which His being manifests itself. The "Bahir" adopts metempsychosis and solves by it the question why the just suffer in this world, while the wicked are prosperous: "The just may have been wicked in their former lives, and the wicked righteous" (§ 58). "Because the hands, having ten fingers, allude to the ten Sefirot." "The ten 'Sefirot belimah' (out of naught) are analogous to the ten fingers." 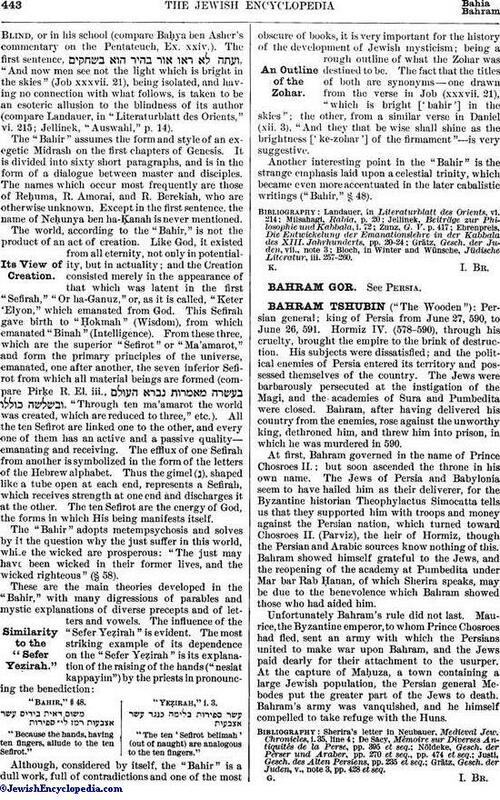 Although, considered by itself, the "Bahir" is a dull work, full of contradictions and one of the most obscure of books, it is very important for the history of the development of Jewish mysticism; being a rough outline of what the Zohar was destined to be. The fact that the titles of both are synonyms—one drawn from the verse in Job (xxxvii. 21), "which is bright ['bahir'] in the skies"; the other, from a similar verse in Daniel (xii. 3), "And they that be wise shall shine as the brightness ['ke-zohar'] of the firmament"—is very suggestive. Another interesting point in the "Bahir" is the strange emphasis laid upon a celestial trinity, which became even more accentuated in the later cabalistic writings ("Bahir," § 48). Bloch, in Winter and Wünsche, Jüdische Literatur, iii. 257-260.